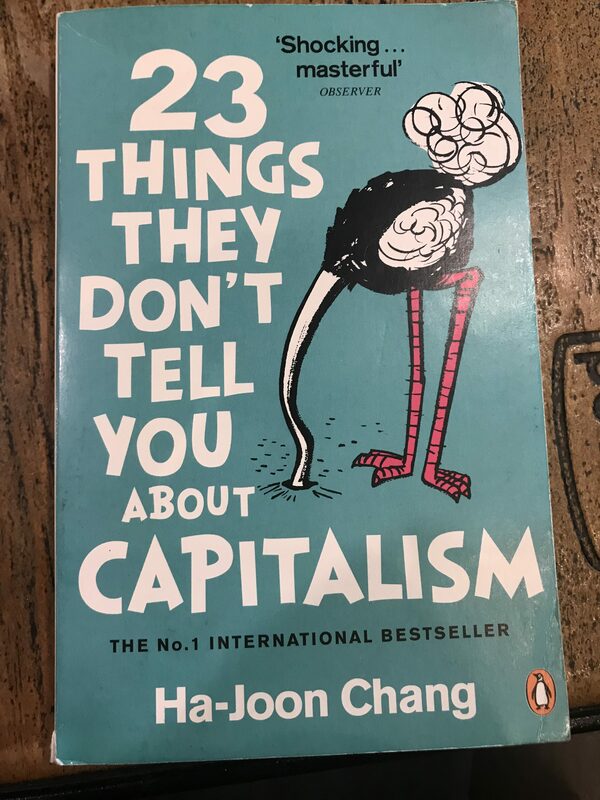 In this chapter the author makes the point that in rich countries people are paid dramatically better for doing the same job, only because the system of the economy in rich countries is more “advanced”, and because their governments exercise protectionism in the form of immigration control. The fallacy that the free marketers commit is that they wrongly claim that people are paid better for their relatively higher productivity, which is not the case. The implication is that government practices intervention in the form of restricting labour mobility into the country, which is a necessary thing, and that discredits the idea of a free market. In other words, if the market had been truly free, it would have permitted everyone who wished to enter, to do so. And then all workers entering that society would have been paid low wages as in the poor countries of their origin. If I understand the argument correctly, then it is that this is a good thing, because the sudden influx of low-wage competition would be bad for social cohesion in that country. It would make workers in the rich country unhappy because their wages would be suppressed. What does not seem to bother the author, is what happens to the workers of the poor country. He seems to be quite sanguine about the fact that they are paid at the relative level of their productivity, even if that brings about huge inequality of income between workers of the two countries. Surely if he is concerned about social justice, he should rather worry about the poor country’s workers? Let’s start with the point about competition. The puzzling aspect is that Mr Chang sees an increase in competition as a problem. Why would that be, especially as he says the workers in the rich country are paid more than they are worth? Competition is beneficial, because it improves the cost-efficiency of labour, and lowers consumer prices in the economy. It has been shown repeatedly that immigrants are a boon to any economy. It is not clear then why Mr Chang wants to keep the wages high by way of government intervention. It is almost as if he sees the country as a kind of trade union that operates to benefit its members at the exclusion of non-members. But let’s examine whether free immigration would cause the disaster the author fears: does it mean we are likely to see a race to the bottom as immigrants drive down wages? First of all we must remember that all workers in a rich society like Sweden get paid higher wages than workers in, say, India. Everyone in Sweden is better off, because the economy is more advanced and more productive. That means that employers have to offer higher wages than they would in India, because otherwise the wages offered would not be competitive in the Swedish economy. In Sweden no-one would sweep the streets, or drive a taxi, for the same price as in India. Because everyone gets paid more, the cost of living is higher in Sweden, as higher labour costs make things more expensive. So Swedish employers have a limited choice. They have to pay more, or forego the benefit of the service. But having said that, workers in Sweden are not necessarily rich because of such an arrangement. If we apply the principle of purchasing power parity, then a taxi driver in Sweden cannot buy all that much more in Sweden than his counterpart in India can, when it comes to basic necessities. Yes of course the quality of goods, services and housing is better in Sweden than in India. But the worker has to pay high Swedish prices to get those things. But is it entirely correct to say that the productivity of a taxi driver is the same in Sweden? Of course, taken literally, it is. A taxi driver in either society covers only so many miles per time unit. He cannot really achieve better output than the Indian driver can. But surely that is not the end of the story, is it? The passenger still gets much more value for money in Sweden. And the reason for that is that he or she gets from point A to point B in Sweden, not in India. We know that the general quality of life is higher in Sweden. Being transported where you want to go (or getting any service) in Sweden is for that reason alone, more valuable in Sweden than in India. Productivity narrowly defined is not the only reason why consumers get more value for money out of a taxi ride. Which partly explains why workers get paid more in rich countries. Consumers are prepared to pay for the more expensive service, after all. That also explains why workers want to emigrate to free, wealthy countries, rather than the other way around. Even so, immigrants to a rich country would probably still charge less for the same job – in other words, undercut their local competition to some extent. The evidence is for example that immigrants to the USA are paid less when they start working, (even though they typically soon surpass the locals). But there are severe constraints on immigrants undercutting local workers. Immigrants still have to make a living in the new economy, which is vastly more expensive than where they come from. That being so, they will discount the price of their labour only enough to create a competitive advantage at the margin. They are hardly likely to ignite a “race to the bottom”. In the meantime investors and consumers benefit from the cheaper services, as the former make more profit (leading to more investment) and the latter enjoy cheaper services. In a competitive market taxi rides will ultimately become cheaper. More serious problems occur when the taxpayer has to pay for social welfare made available to immigrants. However, no free market would permit that. Creating a taxpayer-funded safety net for immigrants creates a moral hazard and an economic risk of freeloading. In a truly free market there would not be such a risk. Will unfettered immigration lead to social unrest? Bear in mind again that we are talking about a free market. In a truly free market there is prosperity and a high demand for workers. It is a well-known phenomenon that unskilled immigrant workers often do jobs that locals do not want to do. Locals who lose their jobs due to immigrant competition will mostly find other jobs in a free market. Truly free markets have jobs and rising incomes for everyone, including the poor. It is further so that free markets attract by far the highest numbers of immigrants. While about 3% of the world population are migrants, close to 30% of the population of the top ten free-market countries are. The world is replete with examples of free markets that absorb immigrants all the time, and where unemployment is still extremely low. That alone testifies to the success of a free-market economy, and shows that the supposed danger posed by incoming labour is vastly overrated. But even so a situation can be imagined where unfettered immigration would, at least in the short term, put pressure on the social fabric of a free-market country. But the only reason why that would be so, would be because the countries from which these migrants come, are not free markets with similar levels of prosperity in the first place. Migrants only leave their home countries for free markets because they realise that the latter offer better jobs and business opportunities. As we see, to some extent that has already been happening for years. For many years free-market countries have served as the refuge of poor people: The US, the UK, New Zealand and Australia, for example, have been havens to Mexican, Polish, Irish, Indian, Chinese and Japanese immigrants. The question is whether we can say that an economic system that does not allow all and any comers to join it, is not a free market. In our current setup what we refer to as an economic “system” is normally one that is run by a government with jurisdiction over a particular territory. Such a system is therefore assessed according to how well it provides a living to its citizens, not to all and sundry putting up their hands and saying “me too”. To expect such a system to be judged for both its economic freedom and its economic success based on the life quality it provides to millions who do not even form part of it, is grossly unfair. Indeed, one of the driving forces behind economic reform is precisely the fact that we have jurisdictional competition. The very fact of jurisdictional competition has spurred governments of unfree countries to reform. The fact that the free market of one country is not able to accommodate and provide a living to all manner of citizens of other countries that do not similarly have free markets, can barely be laid at the free market’s door. On the other hand the answer to the problem is not to exclude all immigrants by force either. It may lie in helping to make the immigrant’s country of origin so attractive that he does not want to leave in the first place – in other words, to encourage that country also to have a free market. Nothing stands in the way of a free-market country, for example, doing what free–market countries already do in respect of trade, namely to conclude agreements that eliminate protectionism – except that, instead of free trade, they permit a mutual flow of labour, on condition that any new member to the pact undertakes to reform to a free-market economy. (Or it can be done in stages: X number of immigrants for Y number of reforms, etc). Of course in such an event there will be much less need for immigration. Then there will be so many more job opportunities in the new member countries, that workers might be happy to stay where they are. Such a pact will eliminate the income disparities between India and Sweden much more rapidly than any other solution. It follows that if Mr Chang is interested in social justice (and it is by no means clear that he is) he should not engage in semantic games by trying to prove that markets where governments exercise sovereignty over who may cross its borders, are not free markets. Perhaps we can even concede that he is right. Maybe immigration restriction is an intervention in the market. But that would only be necessary because workers in unfree, poor countries are oppressed. That is where his attention should be focussed. The main reason why workers in Sweden are paid more than workers in India, is because workers in India are paid much less than they would have been paid if India had been a successful free market like Sweden. We should not blame the successful system for that state of affairs. Much less can we say that that system is not free. For the time being, we can conclude by saying that the statement that people in rich countries are paid more than they should be, holds no water. The very fact that they are paid more in a free market, is a force for the good. But for that, the poor citizens of unfree societies would have no incentive to ask for, and their governments to give them, a better system. The effects of immigration on the United States’ economy’, Penn Wharton Budget Model, 27 June 2016, available at http://www.budgetmodel.wharton.upenn.edu/issues/2016/1/27/the-effects-of-immigration-on-the-united-states-economy (last accessed 19 April 2017). Gwynn Guilford, ‘Immigrants are getting more out of America’s recovery than native-born households are’, Quartz, 20 September 2016, available at https://qz.com/781527/immigrants-are-getting-more-out-of-americas-recovery-than-native-born-households-are/ (last accessed 17 April 2017).